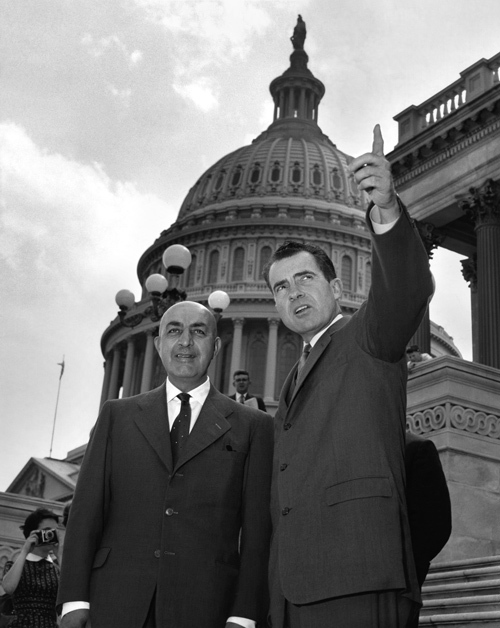 In Small Things Remembered » Prime Minister Daoud and Vice President Nixon visit the U.S. Capitol Building. visit the U.S. Capitol Building. While in the U.S. capital, Daoud met with President Eisenhower, signed an important cultural exchange agreement, and reaffirmed personal relations with Vice President Richard Nixon that had begun during the latter’s trip to Kabul in 1953. The Prime Minister also traveled around the United States visiting the New York Stock Exchange, the Empire State Building, hydroelectric facilities at the Tennessee Valley Authority, and other sites. Courtesy of the National Archives Still Picture Unit. 306-PSD-58-13258.